So if you’ve been following me lately, you’ll know I’ve got a new book coming out right about now and I’ve been talking a lot about organizing your ideas for better visual consumption. As a result, a lot of people have been asking me about how I went about doing exactly that. To answer that, I can only say that I was really, really lucky to get to work with Jocelyn Wallace — one of the best visual strategists in the game. 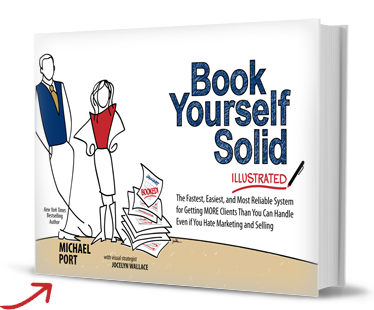 Together we turned Book Yourself Solid into Book Yourself Solid ILLUSTRATED. But there are loads of other tools you can use to create your own visual resources so you get your message across faster and with more impact. Here are some of my favorite visual learning tools. Prezi is a powerful alternative to Powerpoint. Instead of linear, slide-by-slide presentations, you can create presentation “maps” that allow you to zoom in and out around a huge canvas and display your presentation in a more interesting, engaging way. I use Prezi during my Keynote speechs and workshops but I also use it to create videos. This one includes some of the killer visuals from Book Yourself Solid Illustrated. You should know, however, that you can’t make a video using Prezi alone. I record my prezi along with a voice-over using ScreenFlow for mac. You can also use Camtasia. Videoscribe is a smart piece of software that allows you to recreate your own “RSA-style” videos. Check out their sample below. Infographics are all the rage for good, scientific reasons. Not a day goes by when your Facebook feed isn’t full of beautifully designed images that include charts and quantitative information. Piktochart is a drag-and-drop WYSIWGY (what you see is what you get) infographic creator. It comes pre-loaded with high-quality graphics and 80 themes. This image – fittingly about infographics themselves – was created with Piktochart. Visual.ly also creates infographics, and visual representations of your data. It can connect to your social media accounts, or Google Analytics account, and give you a full visual overview of what’s actually going in behind the raw numbers. Check out this infographic – a visual representation of LinkedIn data for Matthew Kimberley, the Head of the Book Yourself Solid School of Coach Training. Memrise is one of the coolest resources I’ve seen in a long time. “The Memrise community uses images & science to make learning easy and fun.” – which means we share EXACTLY the same philosophy. They have interactive classrooms where you can learn anything from math and science to Spanish and German. My friend Tim Ferriss just ran a $10k memory competition over there – it’s finished now but you can still take the course – and I know of at least one person who’s taking part in the Memrise Guardian Chinese Challenge. I really wish that this site had existed years ago when I was doing most of my business book reading. As the name suggests, Readitfor.me is a site that summaries some of the most popular and highly-regarded business and personal development books in an easy-to-digest audiovisual format. The video on their homepage is well-worth checking out. Then, share in the comments what your favorite visual learning tools are. I’d love to hear from you! Great list, Micheal – thanks! I myself am a long-time Prezi addict – have used it in both presentations and course videos with great success. Also love Piktochart – great choice for infographics. Definitely going to check out Videoscribe…that one looks interesting! Thank you so much for this post Michael. This is a collection of tools I’m looking forward to making lot of things with right now… So helpful. What I really impressed by in your BYS system is how structured it is, making things so logic, related to each other and easy to understand. Now adding a visual layer to your highly structured system takes learning to whole new levels .. Congratulations! yahoo – This totally speaks to me! I am such a visual kinesthetic learner that this style of presentation rocks my world! Thanks! Although each and everyone of these is pure AWESOME, I’m having a blast with #5 and #6. Thanks for sharing these with us. That’s brilliant. I guess it works! This is crazy helpful, Michael. Thank you! I am emaling you from Mexico, and I would like to know if your illustrated book is available in a Spanish. The illustrated edition of Book Yourself Solid is not yet available in Spanish, I’m sorry to say. However, the original edition of the book IS available in Spanish. Thank you for great list of great animated video makers the best among them is video scribe because its best in creating whiteboard animations.